Spider Solitaire Classic. Play one of the most popular classic card games ever! Objective in Spider Solitaire is to stack all cards of each suit in descending order from King to Ace and clear the field. Only card sequences of the same suit can be moved between columns. Choose among three difficulties and rack your brain to solve the puzzle! This game can be played on all devices. This game is one of the board puzzle games at RoundGames. Enjoy and have fun in playing this free online game. 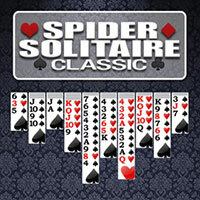 Spider Solitaire Classic is a free online game on Round Games.